Apple's Fiscal Year 2017 (ending in March) revenues in India grew YoY by 17 percent and its profits in the subcontinent grew by 44 percent, despite intense competition from Samsung and a series of Chinese makers working to flood the emerging nation with cheap smartphones. That data, published in India Times by Writankar Mukherjee, comes from a Registrar of Companies regulatory filing by Apple. Now that growth in the massive Chinese market is beginning to contract, new focus is being given to India as a rapidly growing new market for phones with vast potential. Apple's strategy in India appears to parallel its basic game plan for the U.S. and China: a focus on sustainable profitability with premium products. At the same time, the company has pursued efforts to make its products more affordable, including an initiative to sell remanufactured phones in the country--a plan that was challenged by the government. Rather than pulling its profits out of India, Apple is reinvesting its returns "for further expansion of local operations"
As with China, Apple's total unit share of sales in India is falling as cheap models flood the market. However, an influx of low-priced smartphones hasn't stopped Apple from growing or profiting from its operations in India. 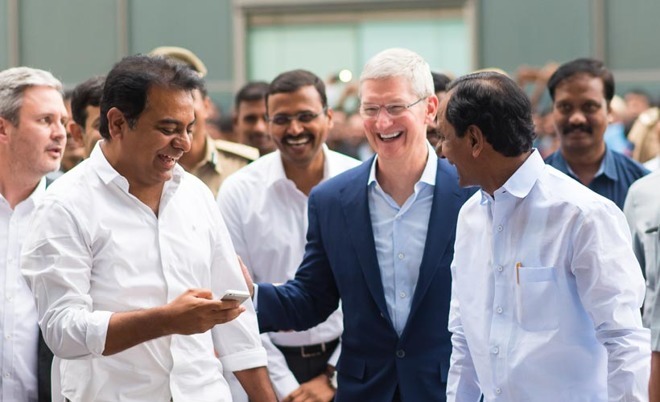 Rather than pulling its profits out of India, Apple is reinvesting its returns "for further expansion of local operations" according to a senior industry executive cited in the report. Those plans appear to include both manufacturing and retail stores. In January, the Indian government granted a waiver for five years on its taxation and sourcing laws that require "single-brand retailers" that are foreign owned to meet a 30 percent sourcing requirement for goods sold. Apple is now reportedly hoping to build flagship retail stores in New Delhi, Bangalore, and Mumbai. Apple also started assembly of iPhone SE models at a Wistron facility in Karnataka, India, that has reportedly also started building more affordable iPhone 6s models as well. Counterpoint Research stated that Chinese makers Xiaomi and BKK (the company producing Vivo and Oppo phones) drove smartphone shipment volumes by nearly 800 percent last year to Rs 22,527 crore (US $3.4 billion). Despite those sales, only Xiaomi reported any actual profit, of just Rs 163.9 crore (US $24.5 million; crore refers to "ten million" Indian Rupee). In comparison, Apple's income in India amounted Rs 11,704.5 crore ($1.76 billion) in FY17--half the revenue of the three largest Chinese brands. Yet it generated profits of Rs 1,556.5 crore (US $234 million), about ten times the annual profits of Xiaomi (and its unprofitable BKK competitor). Looking forward, Tarun Pathak of Counterpoint stated that "the financial performance for Apple India in the last fiscal will not be much different with one of the highest profitable models in the portfolio. Their installed base and average selling price too are going up in India." In the most recent March quarter, Counterpoint estimated that Apple's share of the Rs 30,000+ (US $450+) segment was eclipsed in market share taken by premium models sold by Samsung and BKK's One-Plus brand. However, most of Apple's sales are at the higher end of the premium segment, with a global average selling price of nearly $800. Still, the company faces intense competition in smartphone sales from companies that are hard pressed to find any unit growth in China. Xiaomi has previously indicated that it planned to make virtually no money in phone sales and eventually make money from services targeted at its installed base, but Android buyers have little keeping them attached to any specific vendor, and Xiaomi has yet to produce any impressive results from its services offerings. On the other hand, Apple's Services (including Apple Music, iCloud and app subscriptions) are growing rapidly, from a base of customers who are the least likely to even consider moving to another platform.